Look out for Iowa and N.C. State facing letdown games this week. 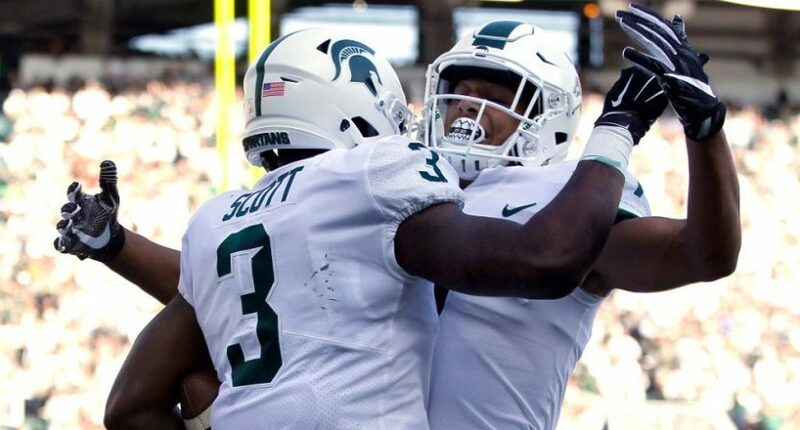 After turning the early season around in Week 3, our college football picks went 3-3 ATS last weekend, hitting on Michigan, Stanford, and N.C. State. That puts us at 12-13 ATS on the season. Here’s who we like for Week 5’s slate of games. MSU is better than last week’s scoreline suggests. The Spartans played Notre Dame evenly. Their three turnovers – a pick six, a fumble that set up the Irish on the MSU 24 for a TD drive, and a fumble in the red zone, were devastating. MSU also missed a 4th-and-goal conversion. Iowa is worse than last week’s scoreline suggests. Penn State outgained the Hawkeyes by 300 yards. Iowa couldn’t get them off the field and could not find any offensive traction until late. Home night games at Kinnick are one matter. Late afternoon (4 p.m.) road games in East Lansing are quite another. It’s a letdown game for Iowa after an emotional loss. Sparty on! N.C. State upset the Seminoles in Tallahassee. That makes this a huge letdown game. Throw in the showdown with Louisville the following weekend. That makes Syracuse a sandwich game as well. N.C. State’s record the week after they give their yearly scare/upset to FSU or Clemson isn’t the best. The Wolfpack’s strength is a stout run defense. They are much softer against the pass. That suits the Orange who bring a high volume, up-tempo passing game. Cuse also played LSU tough last week in Baton Rouge. It was a 28-26 game until late in the 4th. Not calling for the outright upset, but it’s conceivable. Duke has been outstanding against the spread. They have been playing excellent defense. Oddsmakers factored that in with this line. You’re not getting any value. The Blue Devils have been clamping down on the run and forcing teams to beat them through the air. They’ve allowed six pass plays of 30-plus yards in three games vs. FBS. Miami can pick up big chunks through the air. Five different Hurricane receivers had a catch of 19-plus yards against Toledo. Duke isn’t going to the CFB Playoff. The Blue Devils will get caught at some juncture. Miami may be the best team left on their schedule. Mississippi went from the highest of highs (beating LSU by 30 at home) to the lowest of lows (losing 31-3 at Georgia) the past two weeks. Now, they have to get up off the mat for a second-straight road trip at Auburn. Last week, we saw a good Georgia defense put a cork on Aeris Williams and stop Mississippi State from getting anything going on offense. Auburn’s defense may be even better. The Tigers have allowed one play of 30-plus yards through four games. The Tigers win and cover, perhaps on a late touchdown. LSU isn’t good. They couldn’t pull away from Syracuse last weekend until a late touchdown. The one solid Power 5 bowl team LSU has played thus far, Mississippi State, annihilated them. The Tigers are not controlling the line of scrimmage. Through three games, they rank just 44th in yards/carry vs. FBS and 59th in yards/carry allowed. Troy has a quick passing game and spreads the ball to a bunch of different receivers. They gave a much better 2016 Clemson team a lot more trouble last season. LSU wins. But 21 is too many points to trust them with until they prove something, especially in a look-ahead spot before Florida. What does Pitt do well? That’s a question we should be able to answer before expecting the Panthers to cover a 21-point spread against anyone. Against Georgia Tech, Pitt had a punt return touchdown, had a +3 turnover differential, and still undershot the (+7.0) spread by 11 points. Rice has been good at getting to the quarterback. Senior DE Brian Womac has four sacks and eight tackles for loss so far this season. Pitt ranks 117th in sacks allowed. There’s just not enough to trust the Panthers with that many points.